Space technology is imperative for sustainable development on Earth—and for the benefit of all. Author of Hidden Figures: the #1 New York Times bestseller, and inspiration for the #1 movie. We’ve been to the moon and back. 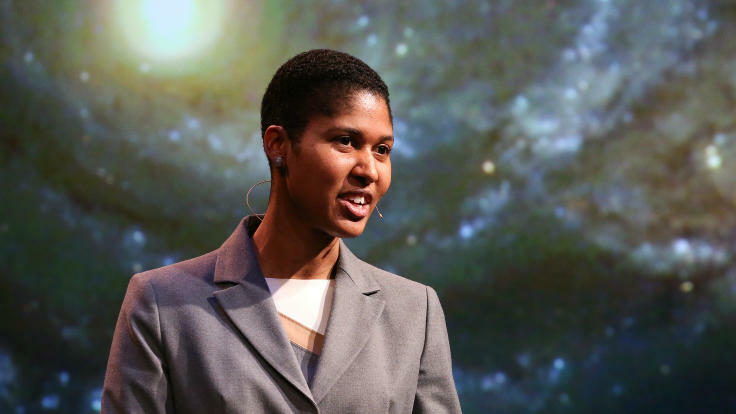 Now, Danielle Wood is taking on the imperative task of using space technology to save Earth. Director of MIT’s cutting-edge Space Enabled Research Lab, Wood uses tools that typically orbit us to advance social good on our home planet. In her talks, Wood takes audiences behind-the-scenes of her projects—like pairing African teens with space technology and empowering them to improve their water sources. Innovative and truly entrepreneurial, Wood shows us how to harness the most complex, cosmic technologies to address the here and now. “How can a satellite be an instrument of justice?” asks space engineer, teacher, and development scholar Danielle Wood. Are the materials causing anyone harm? Are they accessible only to a select few? As director of the MIT Media Lab’s Space Enabled program, Wood puts these questions into action, working with scientists, engineers, and fine artists to use tech like communication satellites (which we already use for cell phone and internet service) to change the world for the better. “Positioning satellites tell us where we are by telling us where they are,” explains Wood in her TED Talk. Scientists can use these technologies to do things like track endangered wildlife, predict destructive storms, or understand which areas of the world are in danger of famine or drought—communicating that data to aid organizations. Her talks illuminate fascinating concepts like building a “moral supply chain, ”as well as how scientists and civilians alike can draw from sophisticated, seemingly niche technologies to solve problems that benefit diverse people. A scholar of societal development, Wood’s background is a mix of research and hands-on creation, including satellite design, earth science applications, systems engineering, and technology policy. Prior to serving as faculty at MIT, Wood held positions at NASA Headquarters, NASA Goddard Space Flight Center, Aerospace Corporation, Johns Hopkins University, and the United Nations Office of Outer Space Affairs. A prolific MIT alum herself, Wood earned a PhD in engineering systems, SM in aeronautics and astronautics, SM in technology policy, and SB in aerospace engineering. As director of the Space Enabled Research Lab, Danielle Wood’s mission is to advance justice in Earth's complex systems by using designs enabled by space research. In this entrepreneurial and inspiring talk, Wood explores the six types of space technology that she and her team are using to support societal needs. These include satellite earth observation, satellite communication, satellite positioning, microgravity research, technology transfer, and the inspiration derived from space research and education. As she poignantly shares, barriers remain that limit the application of space technology as a tool for sustainable development. Here, Wood explains how she challenges these barriers, sharing the multiple disciplines that she works with: design thinking, art, social science, complex systems, satellite engineering and data science. Whether you’re an aeronautical engineer or an social entrepreneur; an astronaut or an actuary, Wood’s talk shows how cross-discipline and cross-organizational collaboration will ultimately take us farther in our goals. Through it, we can collectively bring about a more just, and more innovative future. How Can Space Technology Improve the Life of All People?